Since 2011 CDN has been committed to exploring the process of Digitalisation and youth participation, digital rights, online and offline activism and their correlation with democracy and inclusion. Many of our former participants contributed to the establishment and remained active in CDN’s Digital [x] working group. This project is an initiative of the working group, too. The phenomenon of digitalisation is global with severe implications in many European countries, directly and strongly affecting young people. Young activists have seen personal information as well as confidential sources exposed. Youth rights are endangered by populism and authoritarianism and these in turn result in crackdowns on civil society, a disruption of public discourse, a monopolisation of media, and the sowing of distrust of information coming from civil society. The centralisation of information and impoverishment of public discourse are one of the reasons why so many of the countries in the area see a huge outflux of young people, who simply see no way in which they can be heard and effect positive change in their countries. In the same vein, those who do stay and engage in the new and emerging civil society organisations often find it difficult to engage with their target groups. The most important media channels are controlled by those in power, and in the new media (e.g., the internet) young people are – due to filter bubbles – hard to reach and – due to distrust sown by state media – even harder to convince. 1.1.What will we do and why? Raise awareness among the young activists and youth workers regarding digital space as a transformative political space and how it affects democracy and civil society both online and offline by facilitating new forms of participation enabling individuals to claim, construct and express selves and political demands. Explore information war, hoaxes, dis- and misinformation, and equip the activists with knowledge on how to critically analyse the news because it is young activists who can be the most effective multipliers. Find and promote new, creative ways of engaging with the public online. Last but not least, to foster cooperation between the digital media professionals and young Green activists in order to actively promote youth participation in internet governance. This project proposes a series of three activities structured around three educational international youth activities. With three phases of activities we would like to stress the importance of Internet, Information and communication in building participatory youth democracy. The 1st phase of the activity is to set the initial grounds about the topic and explore internet as a form of technology that changes culture: We aim to bring together young Green and Digital activists to deepen the knowledge about the digital space, our rights within it and imposed limitations. 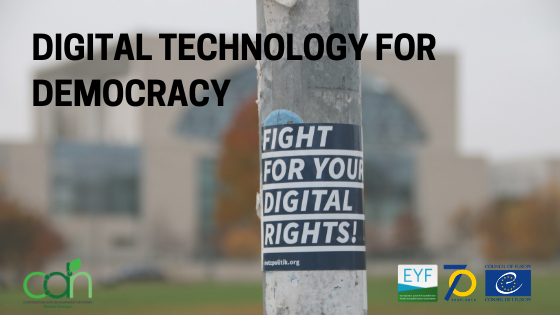 We aim to explore internet an arena and supportive tool for youth democracy. This is the first core event putting forward the relevance of activism within and about the digital environment and thus it sets the grounds for the upcoming activities. Moreover, we understand that only technology and information is not merely enough for engaging the wider audience in the causes we fight for: the third key component is application of the digital knowledge in our actions of participation. Therefore, the 3rd phase concentrates on creative new ways of communicating with one’s audience online though interactive creative means (e.g. storytelling, online games, or (responsible) bots). This way we would like to give activists tools to engage with an audience increasingly tired of, and hard to reach with, traditional means of communication. In the frame of the workplan participants will have a chance to develop a publication, tool-kit, video, podcast, advocacy campaigns and follow-up small-scale project ideas in order to reach out to more young activists and people interested in the process of digitalisation and active youth participation. The program will be based on the principles of non-formal education and intercultural learning. We strive for active, inclusive and direct communication and transfer and sharing of knowledge. Sessions will be balanced between theoretical inputs, training, workshops, discussions, reflection, planning, brainstorming and other interactive methods of learning.